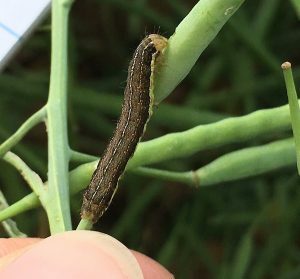 Scout for bertha armyworm, lygus bugs and diamondback moth larvae on pods, but only spray if insects counts are at or above economic thresholds. Try this quiz to brush up on thresholds. 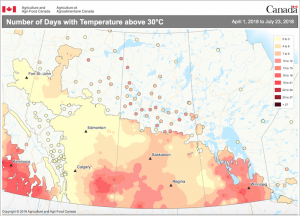 I has been a hot growing season so far, as shown on this map. Hot days will be a major reason for missing pods this year. 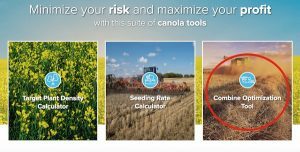 The combine optimization tool at www.canolacalculator.ca will help farmers set the combine to keep losses as low as possible while finding a balance with productivity and grain quality. Take a look at the roots of plants that are showing unusual amounts of heat and moisture stress. These plants may be facing premature wilting and even death due to clubroot, and mounting stress from the environment can make these plants stand out even more. **UPDATE** Due to the rush on single day registrations, the registration deadline (full or single day) has been extended to Tuesday, July 31. Registration closes Friday for the International Clubroot Workshop in Edmonton August 7-9. Days 1 and 2 have incredible international experts presenting on clubroot research and findings in their regions. Day 2 includes a tour of a one-of-a-kind clubroot nursery with many plots and demonstrations, greenhouse work and other clubroot-related experiences. Day 3 is about agronomy-related topics, with presentations on clubroot challenges, management options including liming, and a field tour. Every crop protection product has its own pre-harvest interval (PHI) — which is the time required between spraying and cutting the crop. PHI is also often different for the same product used on different crops. 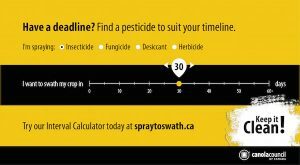 The quick and simple calculator at www.spraytoswath.ca helps you find a canola fungicide, insecticide or pre-harvest herbicide that fits your timeframe. 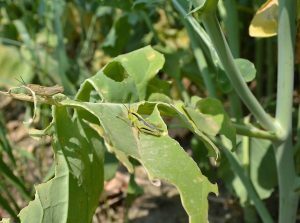 The nominal threshold for grasshoppers in canola is 8 to 12 per square metre. The challenge with the nominal threshold is counting the grasshoppers. As soon as you walk into an area, grasshoppers take off and do not cooperate with your attempts to count them. 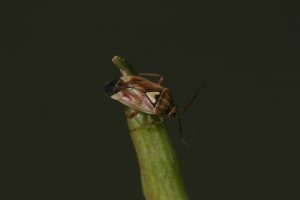 So entomologists have come up with more practical scouting techniques. The later hail occurs in the season, the more damage it can do to yield. 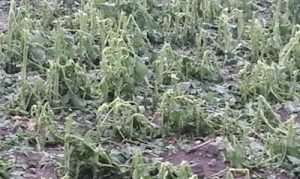 Crops not mowed down by hail can see some yield recovery. 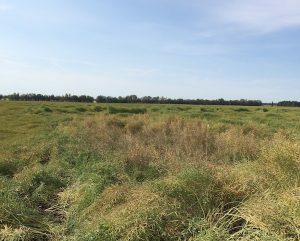 Never use malathion to prepare canola for storage or treat bins in which you plan to store canola. 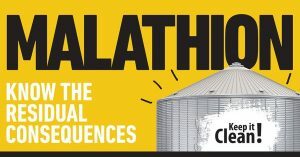 Malathion residue can linger in bins for up to six months after treatment and can be transferred from the bin to canola seed, putting marketability at risk.